Bhí turas den scoth ag Rang 7 sa Ghaeltacht le gairid. D’imigh an rang ar leath i ndiaidh a naoi maidin Dé Céadaoin agus an ghrian ag scoilteadh na gcloch. I ndiaidh dúinn sos a bheith againn i Dún Geimhin, ar aghaidh linn go Tír Chonaill agus Páirc Ghleann Bheithe. Ba mhór an pléisiúr agus an sult a bhain na páistí as an turas thart fán chaisleán agus an siúlóid (uair an chloig) ar ais chuig an bhus. Shocraigh muid isteach sa bhrú i dtrátha a ceathair a chlog agus ar aghaidh linn chuid Sargent Pepper’s, scollóglann ina bhfuair na páistí bia blasta! Chríochnaigh muid an lá sin le súgradh ar an trá agus ar ais sa bhrú le scannán. Ag deireadh na hoíche bhí na páistí tuirseach traochta agus thit siad a chodladh gan mhoill. Ar an dara lá, i ndiaidh bricfeasta mór maith, thug muid aghaidh ar trá Mhachaire Rabhairtaigh, áit a raibh spórt agus spraoi ag na daltaí ag súgradh sna dubhaigh. Bhí lón againn ar ais sa bhrú agus, ansin, bhí scoth craice ann in Ionad Cois Locha tráthnóna. Ba mhór an sult a bhain na páistí as na gníomhaíochtaí uilig atá ar fáil san ionad, ina measc: an turas báid, zorbáil, ziplíne, an bhó róidió, canúáil agus an pháirc súgartha féin. Arís, tar éis bia blasta sa scallóglann, cuireadh críoch ar an lá le gníomhaíochtaí ar an trá agus le hoíche scannáin. Ba é le brón a mhúscáil na páistí ar an triú lá toisc gur lá deireanach sa Ghaeltacht s’acu a bhí ann. Thug muid cuairt ar an siopa in Ionad Cois Locha chun cúpla bronntanas a fháil, agus ansin, thiomáin muid ar aghaidh chuig Carraig an Dúin, áit ar gairmíodh na taoisí Uí Dhónaill a fhad leis an 17ú aois déag. Chuaigh sé go mór i bhfeidhm ar na páistí go raibh taoisí Ghaelacha i mbun na hÉireann tráth agus bród orthu go bhfuil siad rannpháirteach in athbheochan na Gaeilge. I ndiaidh McDonald’s blasta i Leitir Ceanainn d’fhill muid ar ais chuig an scoil, agus na páistí sona sásta tuismitheoirí s’acu a fheiceáil arís! Last Wednesday R7 Gaelscoil Éanna set off on their Gaeltacht trip, an excursion that we had been looking forward to since the school year started in September. 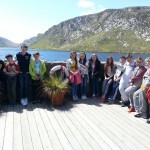 We really enjoyed our stay in the Dunlewey Gaeltacht and the rich culture and language that is there. We all left the school at 9.30am on Wednesday morning (with the sun shining down on us) and, after a brief stop for refreshment in Dungiven, we headed for Donegal and Glenveagh National Park. 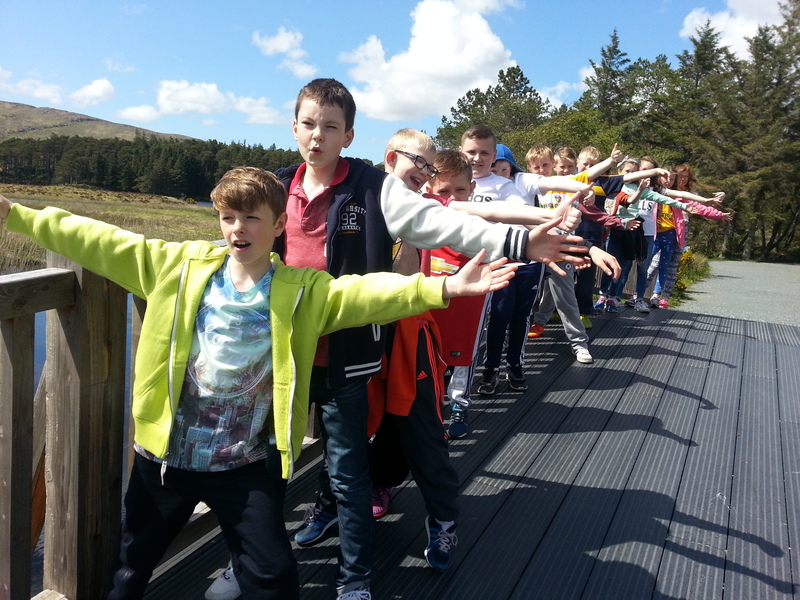 We all had a superb time in the park, enjoying the castle tour, the gardens and the hour long walk back to the bus. After settling into the accommodation (Dunlewey Hostel) we headed for Sergent Pepper’s in Gaoth Dobhair where the children enjoyed at tasty feast. There was no better way to ‘burn off’ the big meal than to spend a fun evening playing on the beach. We finished off a great first day in the Gaeltacht with a film night back in the hostel and, at the end of a long day, nearly everyone was fast asleep before their heads hit the pillows. After a hearty breakfast the next morning we set off on a tour around the countryside of the Donegal Gaeltacht. The weather was not so kind but we had a great time on Machaire Rabhartaigh beach all the same, especially climbing the numerous sand dunes there. 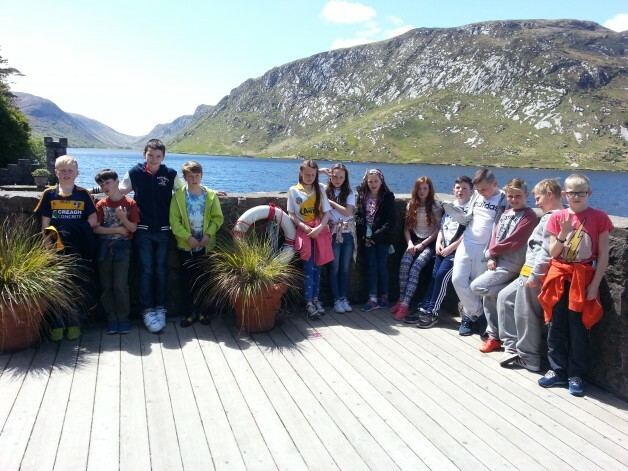 We had lunch back at the hostel, and then spent the afternoon at the Dunlewey Lakeside Centre where there are numerous fun activities for children including: a boat trip on Dunlewey Lake, zorbing, pedalos and canoes, the zipline and the rodeo bull – not to mention the playground itself. After another tasty feed in Sargent Pepper’s we, once again, had a fun evening on Magheraclogher beach. There was an air of sadness when the children awoke on the third day as they knew they would be heading for home shortly. However, a full day still lay ahead. After buying presents in the Dunlewey Centre gift shop we headed for Doon Rock, the inauguration site of the O’Donnells, chieftains of Tír Chonaill, up until 1603. This really brought home to us the prominence that Gaelic Ireland once had and the important role we have in the renaissance of the Irish language. Next was a lunch treat in McDonald’s, Letterkenny before hitting the road for home. 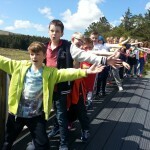 We had an extra special time in the Gaeltacht and forged memories and friendships that will stay with us forever.